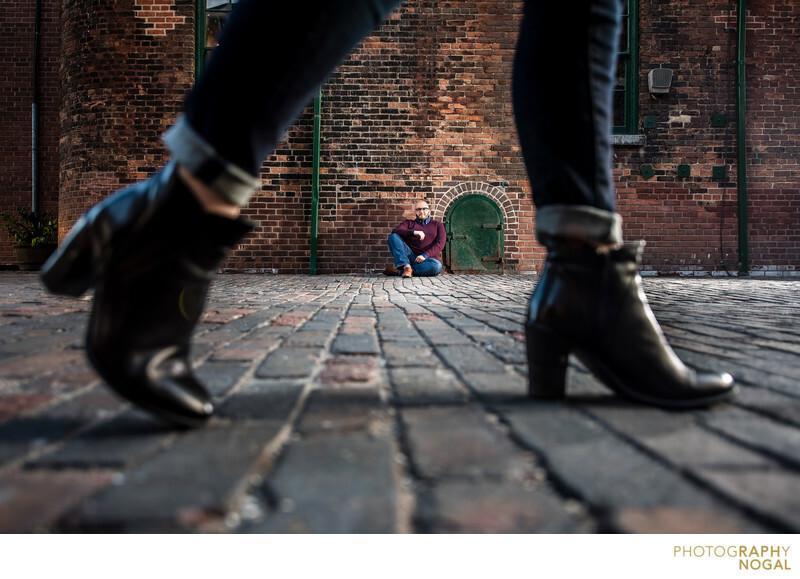 During this engagement photoshoot, I wanted to try a different perspective. I had the Groom-to-Be sit up against the wall on the brick building and I asked the Bride-to-Be to walk by. I laid down on the floor and waited for the right moment where I could be able to capture her shoes as she walked by and have the Groom-to-Be in the background watching her walk by. This image was taken with the Nikon D750 at 1/80th shutter, aperture f2.8, ISO 64 with a 14-24mm f2.8 Nikkor Lens at 24mm focal length. Lighting was created by the Profoto B1 with a Magnum Reflector and about 15 feet away so that the light would illuminate both persons in the scene as well as the cobble stone road and provide highlight on the shoes. Location: 9 Trinity Street, Suite 200, Toronto ON M5A 3C4.